Loren Suddes focuses her civil litigation practice on defending clients in personal injury, premises liability, product liability, and construction defect cases. She also has significant experience litigating commercial and insurance matters involving breach of contract and business torts. Mrs. Suddes has represented clients in a variety of industries including trucking and transportation, insurance, security, lodging, healthcare, communications, and construction. She has practiced in the Superior Courts, Court of Appeals, and Supreme Court of Arizona, the United States District Court for the District of Arizona, and the United States Bankruptcy Court for the District of Arizona. 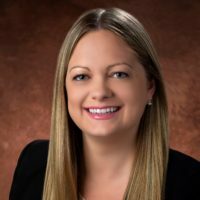 Mrs. Suddes serves on the Board of Directors for the Young Lawyer’s Division of the Maricopa County Bar Association and is a member of Arizona Association of Defense Counsel and the Defense Research Institute.